A new way to screen for early-stage cancer in 70-98% of cases. 06:10 - What is flu? 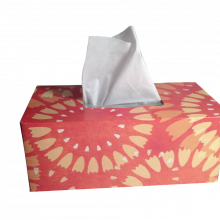 Grab your tissues, it's a "flu's flu" of flu! Georgia - Despite causing such a big problems, the influenza virus is tiny - a spiky football about one 10000’th the size of a full stop, comprising a package of genetic material protected by an outer coat. And once it’s inside you, this little package packs a punch. And how do you get it in the first place? Flu in transferred from person to person through tiny droplets of liquid that you breathe in. A sneeze from an infected person can contain hundreds of thousands of virus particles. Or viruses can survive on surfaces like phones and handrails for two days waiting to literally be picked up. So if you come into contact with flu and don’t wash your hands, there’s a high chance it will make its way inside you and begin its dirty work. The virus begins to multiply, ultimately making thousands of new flu particles. These bud off and infect neighbouring cells, first also converting them into flu factories, and then eventually killing them. But these infected cells sound the alarm with a chemical signal that causes other nearby cells to go into lockdown, making it harder for the flu to get in. But these signals also lead to some of the flu’s nastier symptoms, like fevers, aches and pains, and fatigue. Some of the other symptoms like a running nose and blocked sinuses are also caused by your own body as it goes into defensive mode – mucus makes it much harder for the virus to spread to other cells, and other infectious agents trying to access your airways are thwarted. And as well as going on the defensive, your body also prepares a counter-attack. Your immune system learns what the invader looks like and goes on the offensive, producing legions of antibodies and white blood cells to fight off the assault. But, unfortunately, unless you’ve had the same strand of flu before, it takes time for your immune system to take action, which is why you can be bedridden for days. And for those of us who are over 65, pregnant or with a compromised immune system, the flu can pose a serious threat, leaving you vulnerable to other infections, like pneumonia. So when it’s flu season, it’s best to sneeze into tissues and wash your hands regularly, and if you think you have flu, don’t go to work, as you’re most likely to pass it on in the early stages of the disease. 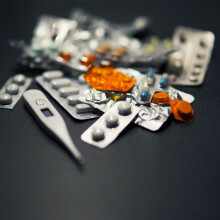 Producing drugs and other molecules to the precise standards expected every time you make the compound and everywhere you make it is a profound challenge for chemists because they need to get the conditions precisely right on each occasion. And, previously, this has caused enormous headaches for the industry. Now Glasgow University Chemist Lee Cronin reckons he’s cooked up a way to solve the problem. As he explains to Izzie Clarke, he and his team divide up the chemical process into simpler steps and 3d-print a series of tailor-made, linked test tubes for each one so that the conditions are perfect for each reaction, and you don’t need a Michelin starred chemist to guarantee you get the right result. 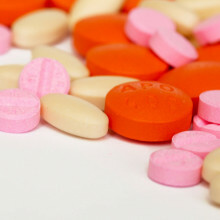 The technology could even allow us to make personalised drugs on demand. Lee - The problem is that chemists are really good at making really complex molecules, but the very best chemist is a bit like a Michelin starred chef in that it’s very difficult to copy them. They’re just so fantastic, they have so much knowledge, so what I wanted to try and do was work out a way to digitise the process of synthetic chemistry so we could get the chemistry to be reproducible. Almost a Michelin star meal in a TV dinner. Izzie - This is all to do with drug production so how exactly have you been able to do that? Lee - What we wanted to do is take the process of organic chemistry that’s normally done in a chemistry laboratory or in a big facility and try and translate that into a digital code. So what we did is videoed how the expert chemist made the molecule, identified all the steps, and then made a digital code so we could come up with a sequence of events to remake the molecule. It’s a bit like having a clockwork music box where you wind up the music box and it plays the same tune every time because the actual notes are hardwired into the box. We wanted to do the same thing and capture the code by making a 3D architecture. Izzie - You’ve actually built a 3D test chamber essentially? Lee - Yes. And what we would then do is trial all the different routes to make the molecule in steps. We would 3D print not just one test tube, two test tubes individually and wire them together with a tube, we’d print it in one big lump, one big monolith, and then test that all together to check that we had produced the compound. We’d then produce a certified blueprint, and then we’d give that blueprint to another chemist to then use with the code to see if they could then get what the expert had done. Izzie - How do you know that this actually works? Lee - This is a very important point. We spent the vast majority of our time taking this idea and making the drug Baclofen, which is a muscle relaxant. Baclofen is a nice molecule because it’s produced at the end as a solid but it’s quite challenging. There are 12 different processes that have to be done in the right order, in exactly the right way to make the molecule. We digitised Baclofen in the laboratory and then 3D printed the mini factories, and then kept adding the reagents and tweaking it, changing the volumes, changing everything until it became absolutely foolproof so that even a non Michelin star chemist, like myself, could actually make the molecule. Izzie - Can this be applied to any drug or is it still at the very early stages? Lee - Well, conceptually it can be applied to any drug. The big difference is that we were 3D printing plastic rather than doing it in glass so there’s chemical compatibility, and there’s also a thing about how much you want to make. What we’re doing right now to follow up is to choose hard to make molecules that are in short supply and very expensive, but not made at big facilities, so we can show how it’s really worthwhile and get people using it to make fine chemicals for, say, cancer investigations in the lab and so on. Izzie - Those fine chemicals, I guess, would be quite important if you need a more personal approach to the drugs that you need to take for some certain illnesses? Lee - Precisely. You’re an individual and everyone’s disease is slightly different, particularly if it’s unfortunate enough to be something like cancer. So what you might be able to do in the hospital then is work out what particular type of cancer as a function of the genetic and the environmental errors and then just produce a molecule in the right form, right dose, just for you. Then that reduces your side effects, rather than trying to make a molecule that okay for many hundreds of thousand of people we just make one for you. Izzie - So that is one huge benefit. What are the other benefits for this method over going to big pharmaceutical companies and the like? Lee - By doing this outside the factory we can digitise drugs and almost do to drugs what the ebook has done. We can basically read any ebook we want, make any drug we need. This is important for drugs that are now longer made, for drugs that are unstable but, more importantly perhaps, if you needed an urgent medicine somewhere else in the world you could just beam in the information by satellite and use that information to make the factory and the molecules at the point of need. Georgia - It may be a current problem but flu is not a new disease. Greek physician Hippocrates described the symptoms roughly 2,400 years ago, and epidemics, which are severe outbreaks in communities, are documented throughout history. But sometimes a new strain can go global, and cause what’s known as a pandemic. The first evidence of a pandemic was in 1580, but the most deadly and infamous one to date was 100 years ago this year. The Spanish Flu. This has been described as the greatest medical holocaust in history, killing more people than World War One. It’s estimated between 2.5% and 5% of the world’s population died, and what made this pandemic especially unusual is that the victims were mostly young adults; more normally, flu is a major risk for the very young and the very old. While flu pandemics occur around every 30 years, none have been as severe as the Spanish flu, perhaps in part due to the development of the first flu vaccine, in 1938. Vaccines work by feeding your immune system small or inactive bits of the virus, so it can learn what the agent looks like, and be ready to destroy it, should the infection be encountered for real. So if we have a vaccine, why does the flu keep coming back? This is because, unfortunately, flu is always one step ahead. The virus grows rapidly, and as it does so it regularly makes genetic spelling mistakes called “mutations”. 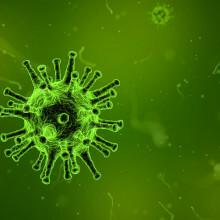 These alter the appearance of the virus as it spreads through the population, giving it a molecular “facelift” that means the immune system struggles to recognise it again later. This is why you need a new flu jab every year, because the vaccine is constantly being checked and updated to make sure that it provides protection against the circulating strains of flu that you are most likely to encounter. But, because vaccines need to be made well ahead of flu season, scientists have to predict what the flu strains will look like when they arrive. Most of the time they get it right, but sometimes the virus behaves unexpectedly, meaning the vaccines aren’t fully effective. Sophie - The display of the male fiddler crab served to advertise his physical fitness, so they not only wave this claw but they also drum it. Sophie - What we found was that the males that waved and drummed more vigorously had better performance, so we actually put them in sprint trials - we made them run. It’s a nice way to show whether stamina has been depleted. Katie - Is the logic to this then: if I can wave my big claw more quickly, I’m fitter therefore I’m going to be a better match for you? Sophie - Exactly that. A better male. Firstly that he’s got good genes; maybe he is just genetically physically fit and if he’s fit enough to perform this waving display, then he might be fit enough to run quickly from a predator, or to defend his territory, or to forage effectively. These are all things that the female should want to provision her offspring with - genes for these characteristics. Katie - So vigorous wavers were fitter wavers. Good genetic news for potential offspring. 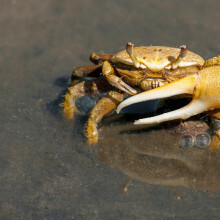 But it’s not just fast waving that gets female fiddler crabs’ hearts racing, it’s fast waving that is getter faster still. Slowing down your waving might indicate fatigue, whereas waving that’s gaining tempo indicates energy to spare, and more interest. But can the female crabs pick up on this increase in waving pace and how do you test this? Sophie - What we have here is the female in a shot glass. She can see the display at the point that we release her. We’ve got a male robot that’s speeding up, and a male robot that is displaying at a constant rate. If I press play on this video… there she is. She’s been released and she’s gone to the side, and she’s now looking at the two males. She makes a dash to the back because she gets distracted by a fly but she’s still interested and she’s edging closer to them and, finally, she runs and she touches the plate of the robot that she’s selected. Katie - What can you conclude from this? Sophie - These were conducted in Darwin in the Northern Territory which is great because there are hundreds of these crabs there - you can get great sample sizes. But what we can conclude from this is that the females are indeed paying attention to changes in rate. They dislike males that slow down. They don’t completely punish them because they’ve been fast before in our experiments, but when they’re faced with a choice of ones that’s speeding up, one that’s slowing down, and one that’s constant they will go for the one that’s speeding up at an escalating rate. Given that we know that these males are more physically fit from our previous experiments, we can see that females are adapted to note these changes in rate. They can avoid the males that are becoming fatigued and they can select the physically fit specimens that have good stamina and good genes that they should give to their offspring. It’s not just about the crabs. They’re a great system; they’re very tractable; you can study them very easily. But so many other animals have courtship displays like this that might be simple, like the waving of a claw, the chirping of a cricket, the movements of the wings, but they might be very, very complicated too. Even the display of a peacock, we would assume that it’s all about colour and prettiness, but he’s got to lift this huge train and wave it about in order to impress the female. So a lot of these motion displays that might advertise his physical fitness could be, throughout the animal kingdom we’ve possibly been a bit preoccupied by prettiness in the past when, in fact, it’s stamina that might be important to our females. Should we be concerned about the levels of flu this year? Georgia - You’d be forgiven for wanting to run to the hills due to reports of this year’s bout of flu, with Aussie flu being accused as the deadliest strain in several years. H3N2, aka aussie flu, is a strain of one type of flu known as influenza A. Despite the name, it’s not actually from australia, although Australia did experience a wave of infections with this form of flu last June and July, and the numbers of cases were much higher than expected. This is partly owing to the fact that we’ve recently discovered that the vaccines against this strain are only around 20% effective due to a problem in production. Now it’s the turn of the northern hemisphere to be hit by the same flu, but should we be worried about a 1918 style level pandemic, as some reports are claiming? If you look at the numbers in the UK, reported cases are not dramatically different from this time last year and we’ve not actually reached the threshold that defines an epidemic just et, although the incidence is climbing so that may change in the near future. There are also large numbers of people being diagnosed with other respiratory viral infections that also produce flu-like symptoms, leading people to think they have the flu when they haven’t. On top of this, hospitals are under more financial strain this year, which may be affecting their ability to cope, and this is further fuelling some of the more apocalyptic headlines appearing in the press. That said, we can’t afford to be complacent about the flu. Every year more than half a million people die from this infection. And if you are at high risk, because you have a chronic illness like liver, kidney or heart disease, a chest or immune problem, or you are over 65, then a flu jab is a good idea, although it’s best to get these before the start of the flu season. So what can you do? Becoming a hermit is pretty impractical and surgical mask are as good as useless. But washing your hands regularly is effective, as is getting a vaccine. So will we ever see a Universal vaccine? 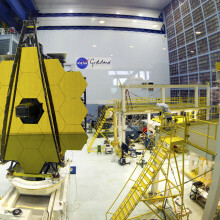 27:42 - What is the James Webb Space Telescope? Imagine folding up a a giant telescope, like origami, squashing it into a rocket and blasting it one million miles into space. "I worked Hubble for a long time. Hubble, when it was launched, rewrote the astronomy books and James Webb’s going to rewrite them again." "The sunshade is about the size of a tennis court and that has to be unfolded in space." "It’s mirror is seven times the collecting area of Hubble. 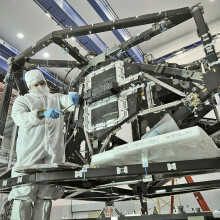 You could put seven Hubble optics in the same surface area as the Webb." "This thing I’ve spent 20 years working on is going to be strapped on a great big rocket and somebody’s going to fire it up into the sky. And that is a little bit nerve-wracking to think about." Izzie - Picture the biggest telescope dish that technology can make. Next to it, a sunshield the size of a tennis court. Now, imagine folding them up like origami into a rocket and blasting them one million miles into space. 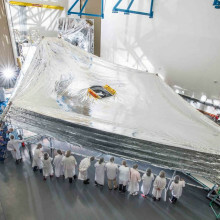 This enormous engineering challenge is exactly what astronomers all across the world are facing as the James Webb telescope undergoes its final tests ahead of launch. And its aims are just as ambitious as it’s engineering. Bill - We want to go back and look at the very beginnings of the universe. Izzie - That’s NASA’s Bill Ochs. He’s the project manager of James Webb, overseeing every step of the telescope’s mission - from design development and terrestrial testing, right through to on orbit operations. Bill - We’re want to back and look at how the first galaxies, stars and planets were formed. In addition, we also want to be able to go look at some of the exoplanets that have been discovered recently. We’re able to determine if they have the basic elements of life. We can’t really see little green men running around on those planets, but we can see if they have the basic elements for life as we know it. Izzie - how exactly is this telescope hoping to explore this? Bill - To achieve our scientific goals there’s a couple of different things you want to be able to do first. We have to be an infrared telescope - as light travels through the universe it goes from the visible light, and as the lightwaves lengthen, it shifts into the infrared part of the light spectrum. We also have to be really big to have a lot of light collecting power, so our primary mirror of our telescope is about seven times larger than Hubble’s primary mirror. That drives a lot of different technologies. We have to be able to fold our mirror up so it fits inside the rocket. Since it’s infrared, it has to be kept really really cold, and we keep it cold passively with this large sun shield that’s about the size of a tennis court. Think of it as a large umbrella. All of those things give us the ability to make the discoveries that I have mentioned earlier. Izzie - For this missions predecessor, Hubble, astronomers and engineers were able to tweak and repair the spacecraft and equipment along the way. But once JWST is in space, that’s it. There’s nothing else that can be done. It has to be right first time. Bill - We can’t do the type of servicing they did on Hubble. But Hubble, I always tell folks, it’s very unique to NASA. Not all of our satellites are serviceable, that’s probably the only one that’s really had a lot of servicing, but we’re much more like a traditional NASA mission where it is not serviceable. 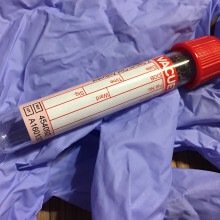 We test, test, and retest; we simulate, simulate, and resimulate to really put it through a very strenuous test programme with a lot of integrity. There’s not much else you can do. Izzie - How far out is orbit? Bill - We’re unique, we’re not like Hubble that’s in a low Earth orbit that was accessible by the Space Shuttle for servicing. We’re going to be about a million miles from Earth, out past the Moon at a point called the lagrange point 2. We go out there for a couple of reasons: 1) again, we want to be really cold; we want to get ourselves as far away from the Sun. It puts the Earth between us and the Sun. It also helps with observing efficiency. Whereas Hubble was in orbit, you go round behind the Earth and the Earth will be between you and whatever you are observing. Then you’ve got to come back around; we acquire than and continue your observation. We can do continuous observations; that saves time and we can make an observation the Hubble makes that may take them days, we can do in a matter of hours because of where we’re going to be located. Scott - The mirror has got 18 hexagonal mirrors that then, in effect, form what’s called one primary mirror. There was a couple of reasons we did that and one of them is that the width of the mirror, the diameter of it, is 6½ metres. Izzie - About the same height as four people standing on each others shoulders. Scott - The top of the rocket we launch in is only 5 metres across so if we build one 6½ metre optic it wouldn’t work. The idea of building multiple segments allows us to put some of of those segments, three of them on one side and three on the other, and we put them on a hinge line. We actually fold them for the way it starts its life on the ground and we fold those along the side and then we can launch and we’re much narrower because then it fits in the side of that cone. And part of the other reason just in short is, it’s really hard to build one 6½ metre optic. It’s also easier to manufacture 18 segments individually even though it’s hard to hold them together and align them. They’re then coated with a very thin level of gold because gold reflects infrared light. It looks pretty but we didn’t do it because it looks pretty. Izzie - Was this always the intention to have this giant mirror that you can fold some of the parts or was that a design process that sort of came on as you were designing the project, and as you were looking at: how are we going to look at the very beginning of our universe? Scott - Early on there was a lot of debate about how big of a mirror, but it was always known we wanted pretty much the biggest mirror we could build and then launch into space. If we could have conceived of building something bigger we probably would have but part of the trades that occur was what kind of material those mirrors were? That took a few years, did we want to build a series of glass mirrors - that’s what Hubble has, what’s called ultra low coefficient of glass? Or beryllium mirrors, and it turned out the beryllium won in the competition as the chosen thing for behaviours and what we thought we could produce. So there was more of a debate about how to build a big mirror, but people always wanted a big mirror. Scott - It took eight years to build the mirrors. There was a lot of planned iteration knowing this was hard. The one thing about building equipment that’s this advanced is you don’t tend to what I’ll say “go for broke” and say alright, here we go. We got 18 mirrors - now let’s go build em. You’ve got to polish them to what’s called a surface figure accuracy, how perfectly shaped is that surface? In our terms it’s 20 nanometres. I can only describe that as bacteria are on the order of nanometres. That means that the shape of this mirror is literally perfect almost to the size of atoms on the surface. But we knew it would be hard so at the beginning we built a development mirror. A little bit smaller but have the same materials and we polished it and proved we can make those features that perfect. Then we started in production and to make 18 mirrors we couldn’t build them one at a time, we’d still be going. We literally had nine machines that were polishing so at any point in time we could have half the mirrors at a particular step or the other half were doing something else. It takes more than a village to build this many mirrors. Then you would polish it and make it more precise and then you’d put it back in the chamber, so we planned a very long cycle. We knew it would take a long time. The great thing was, at the end we ended up with 18 beautiful mirrors and a couple of spares that are just absolutely fantastic. Izzie - What would be the damage if there was a small defect? Scott - the part of the accuracy that drives us is we’re collecting photons (elements of light). We’re collecting photons that are 13.5 billion years old so these are the faintest photons so we’re not going to collect a lot of them. That’s why you need a bigger mirror so you can collect more. You have like a wider swimming pool, you’re going to collect more rain. So we’re collecting these photons and what happens is that the photons hit a primary mirror but they actually have to travel a course where they bounce. They need to bounce off the primary mirror out to a secondary mirror which is held by a tripod. And then they bounce off a secondary mirror right down into the middle of the primary mirror where there’s another optical bench with more mirrors and instruments. Then they finally get to the place where detectors can collect these photons and that becomes our science data. You’ve got to capture the photon and bounce it into the right place. If the surface of the mirror is a little bit off, that photon won’t bounce to the right place and you’ll lose it. It'll just bounce right back out to space so you’ve got to make sure it bounces perfectly. 38:12 - How will JWST see the beginning of our universe? Gillian - MIRI just stands for Mid Infrared Instrument. It’s not a very imaginative name I suppose. Gillian - The mid infrared is a very important part of light especially if you want to study planets and also if you want to study the first galaxies that formed. It’s very, very red light so it’s head radiation, and one of the advantages of that is that you can see better through dust. We know that planets form in very dusty systems and so one of the things we would like to do with MIRI is to understand a bit more about the systems the planets are forming from. Izzie - Okay. So MIRI is looking into the mid infrared region. How does it do that exactly? Gillian - MRI and JWST are like a camera. JWST is like the most ginormous lens you could imagine and it’s gathering all that light from the very faint dust or the very faint galaxy. Then the mid infrared instrument, MIRI, is like the body of your camera so it’s where the detectors are. They’re not CCDs, but it’s the same type of idea, an electronic detector that records the light, and then what we can do with MIRI is that we can use filters or an optical element called a spectrometer and an image slicer or a coronagraph to analyse that light in different ways so give us a way of understanding more about what’s coming from that astronomical source. Gillian - Most spectrographs would have something like a very narrow slit to only emit a very narrow beam of light into the spectrograph. Then the light is split up into its constituent parts by an optical element that we call a grating and it’s similar to a prism. If you put a prism in a beam of light, in front of a lamp or something, you would see a spectrum of colours like a rainbow. So what we’re doing with this grating is splitting the light up into its rainbow of colours so that we can look for the unique ones that are associated with specific molecules. Gillian - For example, we might be able to see methane in their atmospheres or carbon dioxide, and if we can understand a bit better about what the materials are in those planets then, again, that helps us to understand better how planets form and how planetary systems form around their stars. Now everyone knows it’s really hard to see anything if the sun is shining right in your eyes. Well that’s a problem that all the researchers are facing when looking for planets around other stars. Luckily, Gillian and her team found have a few ways around this! Gillian - As the planet goes round the star, some of the time what you see is the light from the star plus the planet, and some of the time what you see is the light from just the star. So, if you subtract the two, what you should be left with is the light from the planet. The other technique is to use is what we call a chronograph. A chronograph is a little black spot that blocks out the light from the star. So you can think of this as like shading your eyes to look at something that’s very bright or, perhaps, putting your thumb or a spot in front of your eyes to block out the light from something. That’s exactly exactly how a chronograph works and if we were, for example, to take an image we’d be able to take an image directly of just the planet in the mid infrared and nobody’s ever done that before. Scott - It also consists of five layers of material. This one layer isn’t enough to block the heat. We are about plus 185 degrees farenheit in the sunny side and we go to minus 388 degrees fahrenheit on the cold side. Izzie - For those of us who work in celsius… that’s 85 degrees celsius on the hot side right down to -233 degrees celsius on the cold side: This sunshield needs to get rid of a massive temperature difference of just over 300 degrees. Which it does thanks to the five layers, each the width of a human hair, of a material call kapton. Scott - It’s a pretty remarkable design. It uses two fundamental concepts… first of all when you’re in space there’s not air so you don’t have to worry about the thermal getting to you. What happens is the light, as the wave of heat comes into you, it’ll hit the first layer and about 90% of that heat due to the surface of this thin layer will reflect right back into space, but that’s not good enough. But then there’s another layer… so that’s layer one. Then there’s layer two and they’re spaced apart, say about 10 inches apart or something. Those will then trap a level of that heat and turn it into a wave and then radiate it out the side. But still, yet again, some of that heat makes it through layer two onto the other side of it. And then we need layer three. It’s going to trap some in its internal reflections and vent it to deep space. And then we need layer four. Then it turned out we were able to stop at layer five. And trust me, we wanted the least amount of layers possible because every one of those layers has to get folded and stowed and deploy on orbit with lots of moving parts. It turns out that in our design it took five of these layers in order to block that much heat. I had the greatest question from an elementary school when I was talking once and this little kid goes to me: why didn’t you just build one layer five times as thick? The root of that is because we couldn’t fold it if we made it any thicker. I gave him an example and he had a notepad in front of him. I said “take the front sheet off your notepad and make a paper aeroplane.” He started making one and I said “that’s pretty easy, you just stop that.” I said “rip the cardboard off the back of your notepad and now make me a paper aeroplane.” He’s like "oh, I can’t do it." I said “Well that’s our problem.” Once we made the paper too thick we were never going to be able to fold it up. So, literally, the thickness of these membranes, four of the layers are only one thousandth of an inch thick, and one of the layers is two thousandth of an inch thick - that’s all they are. Bill - The kind of challenges we face now are: how do you test this thing that has approximately 180 different elements that either pop up, roll out, pull out, do all sorts of things to deploy and get to the shape that you see on orbit? Obviously, the other part of this testing is the testing to make sure everything can survive in those very cold temperatures at it all too. Izzie - How can you bring something this massive down to such cold temperatures? Bill - We actually have to do it in pieces, so we’ll start with the telescope and science instruments. We’ve just completed a major milestone for our product in completing its final, we like to call it cryogenic test, which is where we bring it down to these very cold temperatures. We don’t really have facilities here at Goddard Space Flight Centre so we went down many years ago to Johnson Space Flight Centre and there was a chamber built there during the Apollo era that was about seven stories high - it was built back in the 1960s. We took that chamber, refurbished it and then we went into the chamber with the flight telescope at the beginning of this past summer. It turned out to be 100 day test where we got down to these very, very cold temperatures. Checked the mirrors to make sure you can focus the mirrors, check their alignments to the scientific instruments. We went through that entire test and then you have to warm them back up. Just the cooling down and the warming up takes about 30 days so we had some challenges in there. I think that the biggest challenge that we had was hurricane Harvey. That hit in the middle of the test; we had approximately 160 people down there but we got through that; we actually did some testing during that. The test has been a huge success. They just had the final data review and in the print that we brought in, the look of that data and say, yes, it looks good. It came out said basically we have a great telescope and a great set of instruments. So that was huge accomplishment. Izzie - Next step is to make sure that the telescope can survive the violent shaking and the extreme noise of launch. Bill - We go through what we like to call dynamics testing which consists of vibration and acoustics testing. Vibration simulates the vibration that we’ll see in the rocket with a certain amount of margin, so we actually shake it early on harder than what it would see in the rocket knowing that if it survives that, it can survive the rocket ride. It’s the same thing with acoustic testing, it’s exactly what it sounds like. You put it in a sealed room with two really big speakers and you simulate the sound levels that it would see on the rocket ride. Izzie - So you actually set these to be even more intense than an actual launch would be? Bill - Right. You want to make sure it survives so you’ve got to take it up to another level to make sure there are some margins in between what it sees in the rocket and what it can survive. You don’t want that to be the same because then you’re getting too close to maybe damaging something. What we do is we test things before they go into the vibration and acoustic chambers and then we test it again when it comes out to make sure everything’s working fine. Izzie - How has that gone? Has it been plain sailing or have there been a few surprises along the way? Bill - About a year ago we went through and we tested the integrated telescope and science instruments and that packaged together. We found some conditions in there that we didn’t quite understand - we just stopped. As it turns out there was what we call launch release mechanisms… think of it as two pieces of metal that have teeth in it that eventually come apart but it’s to hold them during launch. Those were basically rattling a little bit and that rattling was picking up signatures in all of our sensors that we really needed to understand. Izzie - This tiny little vibration from a loose latch caused the telescope to shut itself down - but now that’s resolved it’s over to the sunshield. Bill - We’ve just finished deploying the sunshield for the first time. We had a few little hiccups along the way but it worked very, very well. We were all very happy. Izzie - What were some of the hiccups? Bill - Once you deploy the sunshield the five membranes have to be tensioned and we have a unit that makes these sunshields taught. It took a little more force to get it moving than we thought it was going to take. When it finally pulled free we got a little bit of slack inside this tensioning device and the cable got caught. We’re now mitigating that by putting a piece of material that goes around the top of that to make sure that if we have a piece of cable that’s a little loose inside that unit, it can’t get caught on anything. Izzie - So what’s left before launch? Bill - On the spacecraft element which is the sunshield and the bus which has all the electronics boxes we then have to put it through it’s environmental dynamics testing, so it has to go through its simulation of a launch environment. 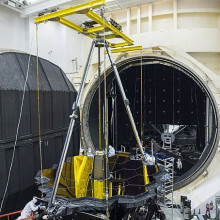 In parallel to that the telescope and instruments will show up at Northrop Grumman once the spacecraft element finishes its testing and also go into a thermal vac chamber. Once it’s done, we then put those two pieces together, so that will take some time. Once those two big pieces are together we do a series of electrical tests to make sure everything’s working fine. It then goes back into dynamics testing. Now the whole integrated observatory will go through vibration and acoustics. But we can’t do any more cold testing because there's no longer a chamber that we would fit in so that’s done once we finish up with the spacecraft element. Once we’ve integrated our telescope there isn’t a cargo plane that it will fit on so we actually have to go by cargo ship out of Long Beach, California, down through the Panama Canal, and then back around over to French Guiana. Izzie - And it’s from French Guiana that the James Webb Space Telescope will be packaged into the European Ariane 5 rocket, and begin its 10 year mission as the most powerful time machine, peering back over 13.5 billion years to see the first stars and galaxies forming out of the darkness of the early universe. Gillian - I’m very excited, nervous - I shouldn’t be nervous. 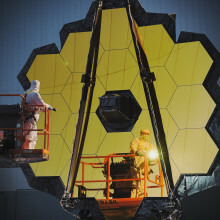 I think the engineers have done a superb job on JWST and on my instrument, but you still sort of think well, this thing I’ve spent 20 years working on is going to be strapped on a great big rocket and somebody’s going to fire it up into the sky. And that is a little bit nerve-wracking to think about even if you are very confident of the engineering. Scott - We always have what I call a healthy nervousness. Nobody should ever be too comfortable with a project this hard because it really is. You’re doing a first of a kind. While we’ve stubbed our toes and things have gone wrong, we’ve never met a challenge that we haven’t been able to solve. And to say we’re sitting here today with a sunshield deployed and the optics completely integrated, we’ve accomplished some of the most significant hurdles in the programme… and it works. I feel great and then I go back to the meetings and I make sure we’re all being worried enough so that we’re prepared for them. It’s good to be worried. Bill - Oh, I’m very excited. This is going to be an amazing telescope. It’s pretty cool, I started my career on the Hubble Telescope. 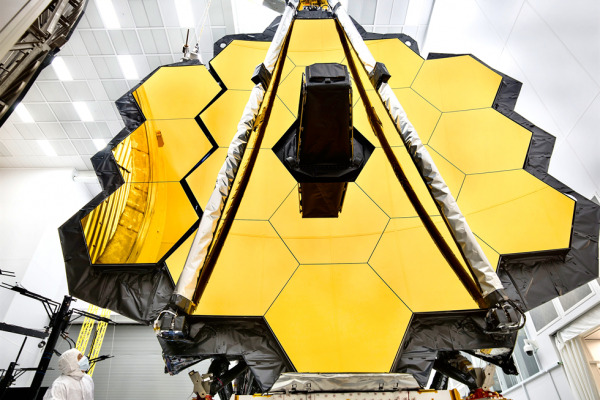 Hubble, when it was launched, re-wrote the astronomy books and now I’m finishing my career on the James Webb Space Telescope and James Webb is going to re-write them again. It’s not just the things we anticipate seeing but really, just like with Hubble, it’s going to be what we never, ever imagined. With thanks to Lemoncreme for ambient piano music.